Money Aisle is an online marketplace where banks compete to each other to offer better rates for high-yield savings account or CDs. I have heard about MoneyAisle a while back, but never got a chance to check it out until recently, partly because back then I was very happy with Dollar Savings Direct’s 4.0% APY. But not anymore (DSD did yet another rate cut yesterday to 2.05%). Yields of savings accounts are falling fast. If you use a savings account that pays you more than 2% nowadays, that actually isn’t too bad because, if you look at the current savings account interest rates, many popular online banks have cut their rates to below 2% in the past month or so. While FNBO Direct has the best rate among banks I am using, I’d like to see what MoneyAisle can offer and whether I can get a better deal if I let banks bid for my business. MoneyAisle is actually an online marketplace where banks bid to win your deposits. The concept itself is interesting and it it could work in favor of the customers because wherever there’s a competition, we can benefit. There Currently, MoneyAisle lets users auction to banking products, CDs and high-yield savings. The auction process is free for users and MoneyAisle doesn’t charge any fee for its users to run an auction (MoneyAisle makes money from participating banks). To find a better CD or savings rate at MoneyAisle, you need to run a live auction to let participating banks compete. In my test, I chose High-Yield Savings account to see if I can pick a bank that’s willing to pay more than 2.15% I get from FNBO Direct. The auction is a very simple process. You only need to provide the amount of initial deposit and your state of residence. The initial deposit in my test auction is $1,000 ($1,000 is the minimum deposit required for the auction). A couple of minutes later, I got the winning bid from Flagstar Bank, a bank I covered before (it’s also in my savings account interest rates table). The winning rate for my $1,000 deposit from Flagstar Bank is at 2.40% APY. The rate is actually from the bank’s Express Money Market Account, not savings account, and the auction rate is the same as the rate the bank currently lists on its website. So no surprise there. I then ran another test auction (you can run a test auction without an account with MoneyAisle but you won’t get the name of the winning bank until you register) with an initial deposit of $10,000. 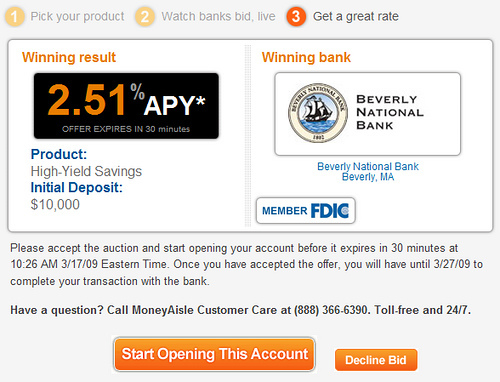 This time, I got a different bank winning the bid with a better rate: Beverly National Bank with 2.51% APY. This is a new bank to me, so I went to the bank’s website to take a further look. It turned out that 2.51% APY is not showing on the website at all (you can find the bank’s products and rates here). Does this mean that some banks are willing to pay higher than publicly advertised rates (the bank also won a $25,000 initial deposit auction) if they can have my money? If this is true, then it makes using MoneyAisle worth it because I won’t get the same rate if I go straight to the bank myself. Once a bank offers me a winning rate, I can then either accept or reject the offer. If no action is taken within 30 minutes after the winning bid is made, the offer will expire. If I decide to take the offer, then I open an account open an account with the winner right away if the bank allows applying for an account online. MoneyAisle offers an interesting way to find, possibly, a better rate for my money. However, it has its own limitation. The problem is MoneyAisle doesn’t have a lot of participating banks. 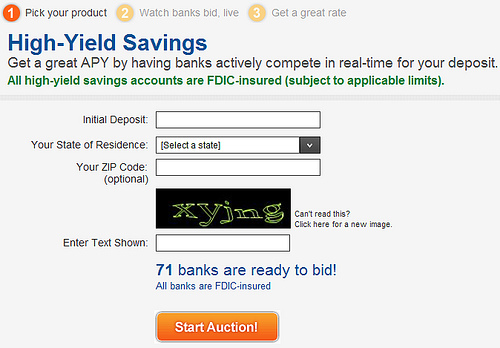 From the test auctions I ran, less than 80 banks (all of them are FDIC insured) participated in the biding. That’s a rather small number (I have 45 banks in my interest rate table and some are offering better rates than the 2.51% from the auction). The small number of banks in the program means that I probably won’t get the best deal, given how many banks out there. I may have a better chance if I run my search through a comprehensive database. The service could be more useful if there are more banks in the program. Besides, since rates change very fast these days, it’s hard to chase rates, even through MoneyAisle because there’s no guarantee how long the auctioned rate will last. It can change at any time, just like what can happen to all variable rate savings accounts. 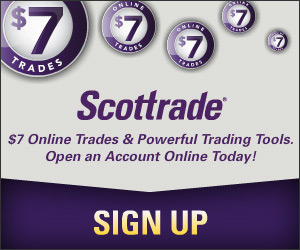 Your better bet could be on the CDs offered through MoneyAisle’s auctions, if CDs are what you are looking for. Any guarantee on how long they must hold the interest rate for? Could a bank win the bid and then drop your interest rate the week after you deposited your funds?